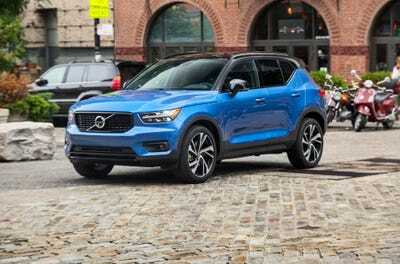 The Volvo XC40 is the carmaker’s compact luxury crossover. The compact SUV segment is ultra-competitive these days. 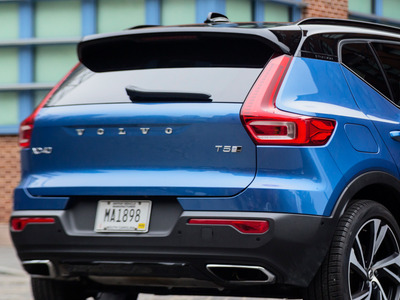 I drove the Volvo XC40 for a week and found it to be a high-tech, premium crossover that was both versatile and thrilling. The luxury SUV segment is getting crowded. 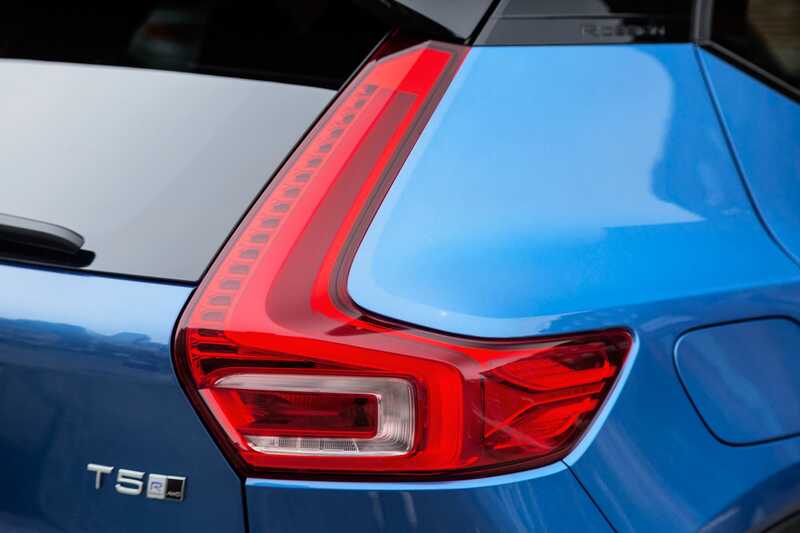 That’s because consumers, seemingly overnight, have turned against sedans. What this means is that well-established brands, such as BMW and Mercedes, are somewhat saddled with legacy four-doors whose sales are sliding. Meanwhile, brands that are re-inventing themselves have a runway to crank out crossover and surf the trend. 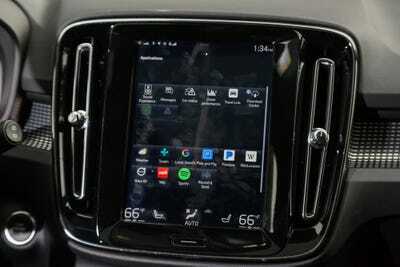 Volvo is one of those re-inventing brands. The Swedish nameplate is now owned by China’s Geely and over the past few years has been rolling out revamped SUVs. The XC90 was Business Insider’s 2015 Car of the Year, while the XC60 was a finalist in 2017. 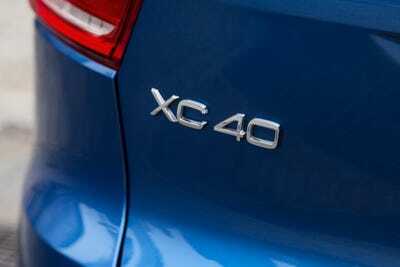 Now we have the XC40, Volvo’s compact offering. You could maintain that this is the most important new crossover of them all, because this is where customers will now start with the brand. For what it’s worth, the start isn’t what it used to be. Decades ago, you bought one of Volvo’s blocky sedans or wagons because they were renowned for safety, looked good dirty, lasted forever, and were anything but German. Luxury was not part of the calculation. But it is now. And so is performance, as Volvo seeks to match up with BMW, Audi, and Mercedes. 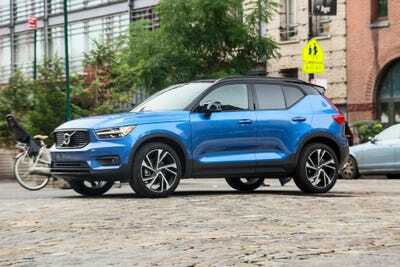 I was lucky enough to try out a performance-oriented XC40 T5 R-Design, with all-wheel-drive, tipping the cost scales at $US45,835, after the addition of numerous options. 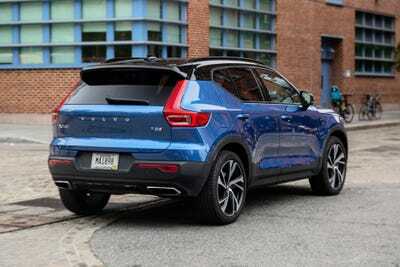 The Volvo XC40 that we sampled for a week was a top-level T5 all-wheel-drive crossover, with the “R-Design” treatment. This is the Volvo that zigs! Ours had a “Bursting Blue Metallic” paint job. 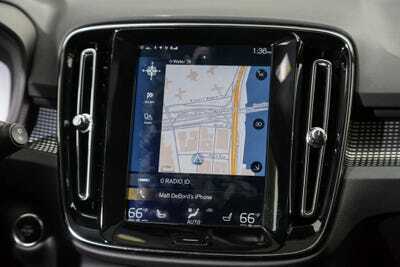 We’ve also sampled the XC90 and the XC60. 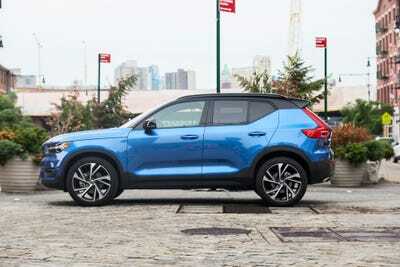 The XC40 is the smallest of the trio, but I like its sleeked-yet-still-boxy Volvo looks more than the XC60’s. The grille is all signature Volvo elements: the legendary badge, along with the newer “Thor’s hammer” headlights. 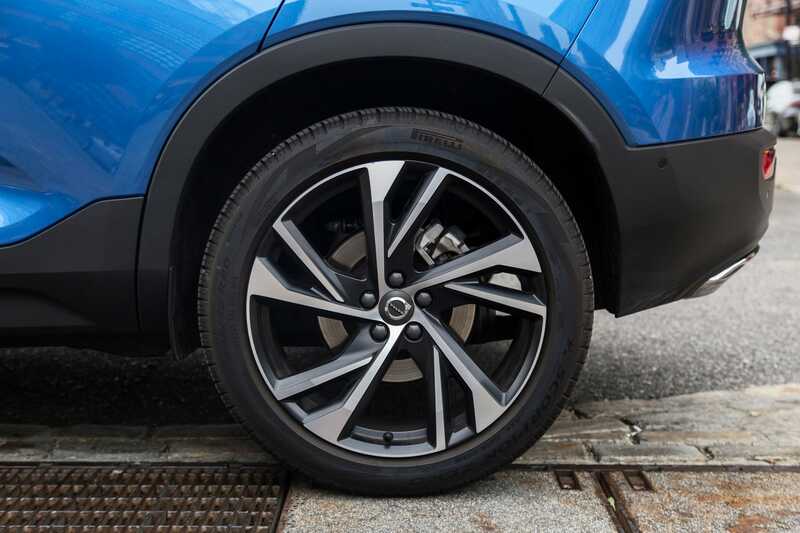 As compact, near-luxury crossovers go, the XC40 fits nicely into the segment. The styling is angular and linear, with few swoops or curves or to distract from the basic silhouette. The road presence, as one might expect from a small SUV with an elevated ride height, is sort of spindly. This isn’t a solid-looking Volvo; rather, it exudes youth and pep. The 19-inch wheels aren’t really large enough to fill the arches — but 20- and 21-inchers are available. 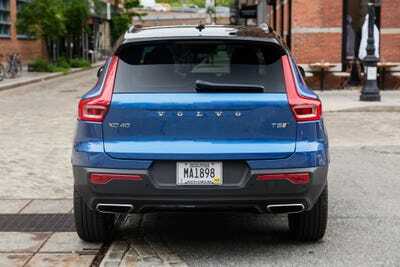 The rear is arguably the XC40’s best angle. If we zoom in, you’ll notice the relatively graceful integration of numerous design elements. Angles galore! 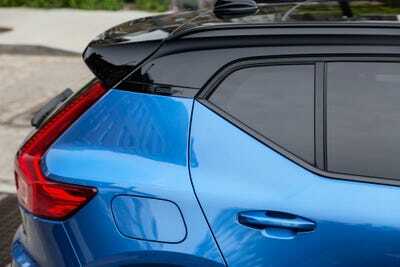 But the two-tone roof-body treatment, the crimped rear window, the hatch spoiler and the jagged shape of the tail lights all echo each other. 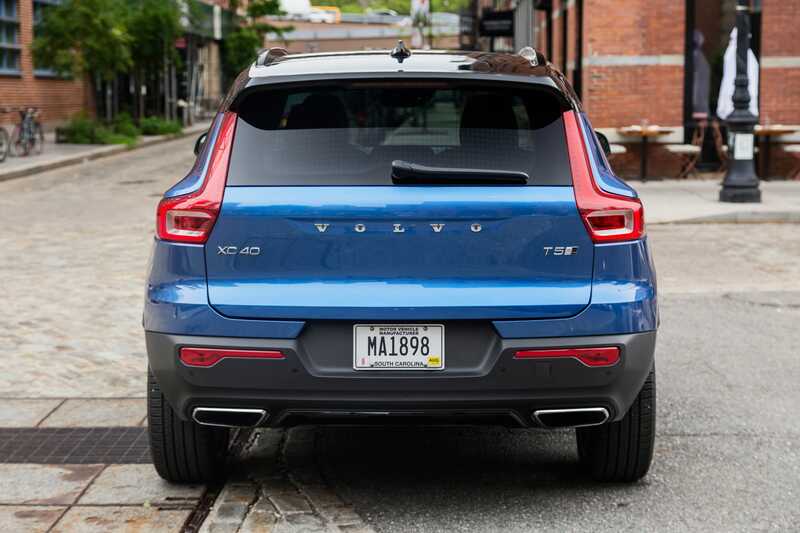 Straight in, the rear presents a familiar Volvo appearance — one that the brand has been using for a decade. 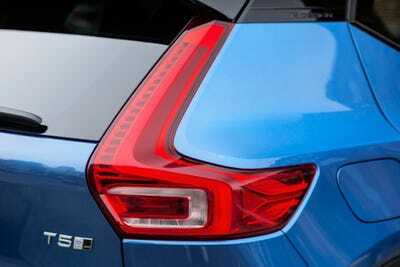 As snazzy as the headlights are, the tail lights have a more stunning configuration. 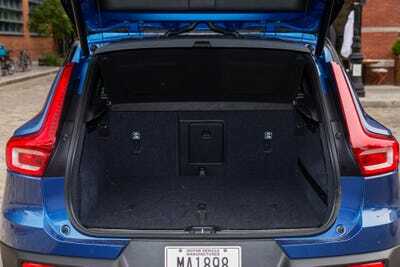 Cargo capacity amount to roughly 12 cubic feet, which is plenty for typical hauling duties, such as grocery store runs and weekend trips. Drop the rear seats and you have close to 60 cubic feet. If you have to transport skis, there’s a useful pass-through hatch. I don’t know — I guess there’s room for sub-compact XC20 in the lineup! 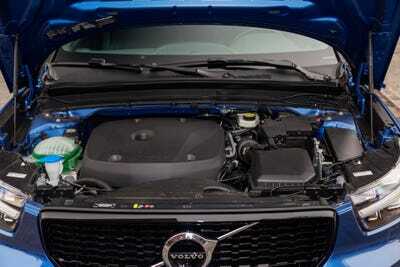 Power is supplied by a 2.0-litre, 248-horsepower, turbocharged four-cylinder engine. With 258 pound-feet of torque, it offers good pop. The 0-60 mph dash passes in about six seconds. 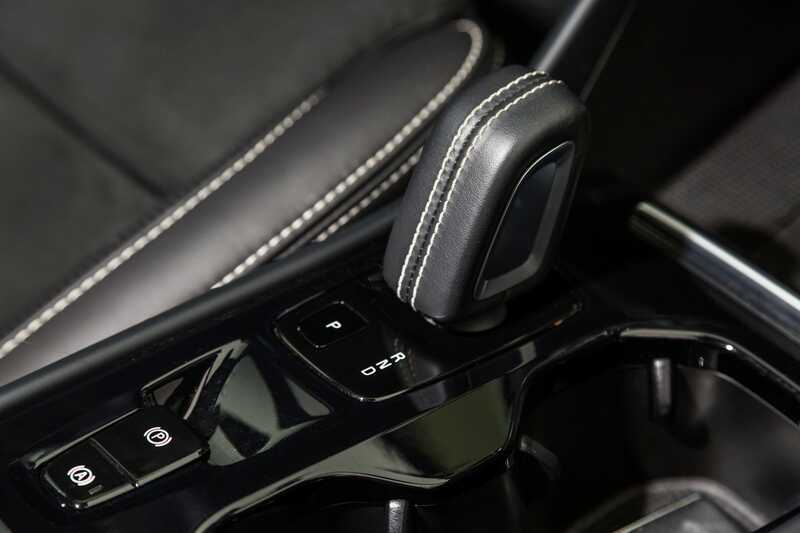 The eight-speed automatic is capable enough, but the shifter is maddening, requiring double pulls to get the XC40 in gear. And auto stop-start feature saves fuel and reduces emissions. You can expect fuel-economy in the 20-25 mpg ballpark. Let’s slip into the cosy, all-black interior — rendered in leather-and-Nubuck. The T5 trim level combines premium appointments with sporty accents. Overall, a pleasant and engaging place to spend time. 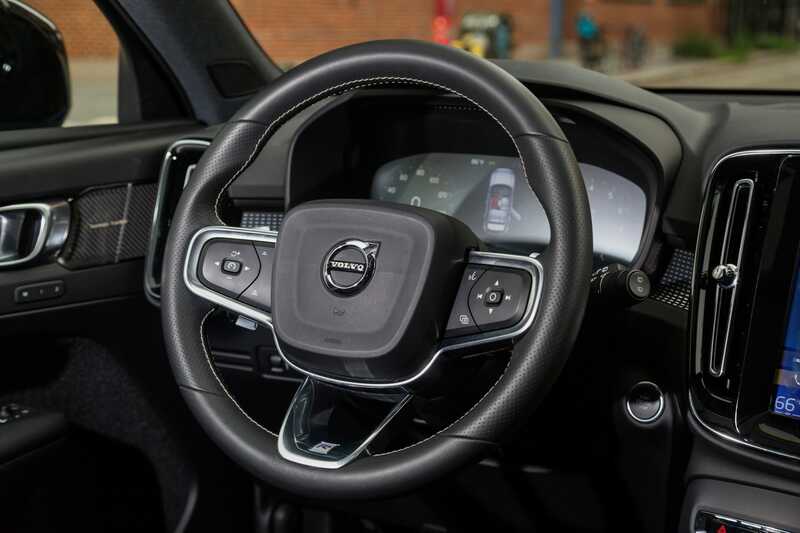 The R-Design steering wheel has the usual buttons and knobs to operate vehicle functions, as well as some nifty topstitching. It’s heated, as are the front seats. 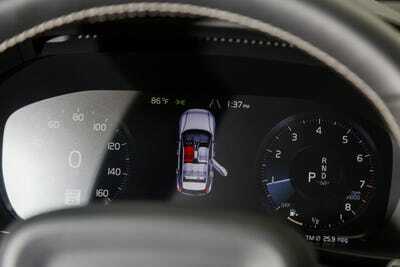 The instrument cluster is digital, but the gauges are analogue. The harman/kardon audio system is sounds quite good — but it’s an $US800 upgrade. The details, such as this piece, are tech-y and sort of odd, but not off-putting. The seats are really, really comfortable. But Volvo is famous for that. 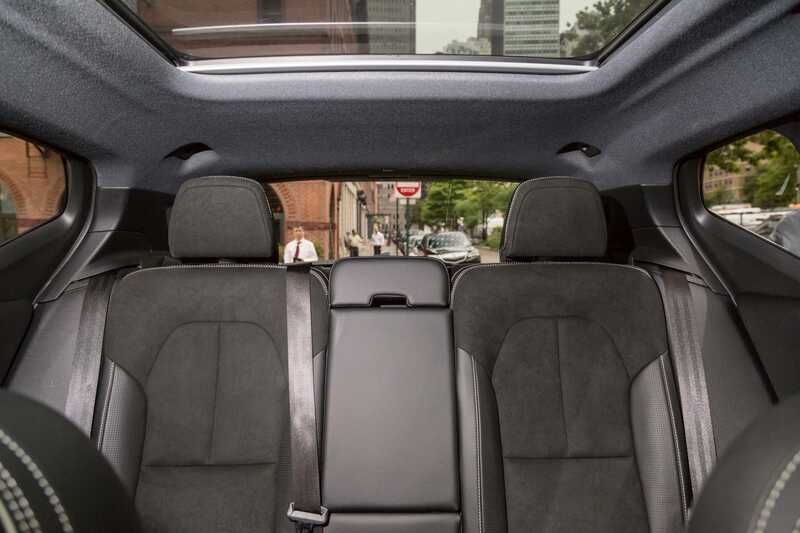 The panoramic roof is a $US1,200 extra —and so worth it, as it fills the compact back seat with light. It makes a difference for the front seats, too. 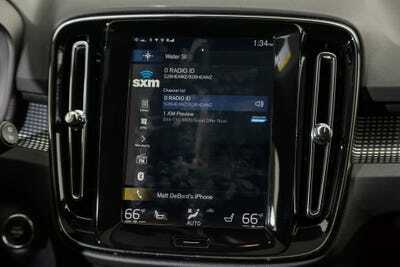 The Sensus infotainment system runs off of a nine-inch touchscreen that’s not been universally praised by reviewers. Personally, I like it. 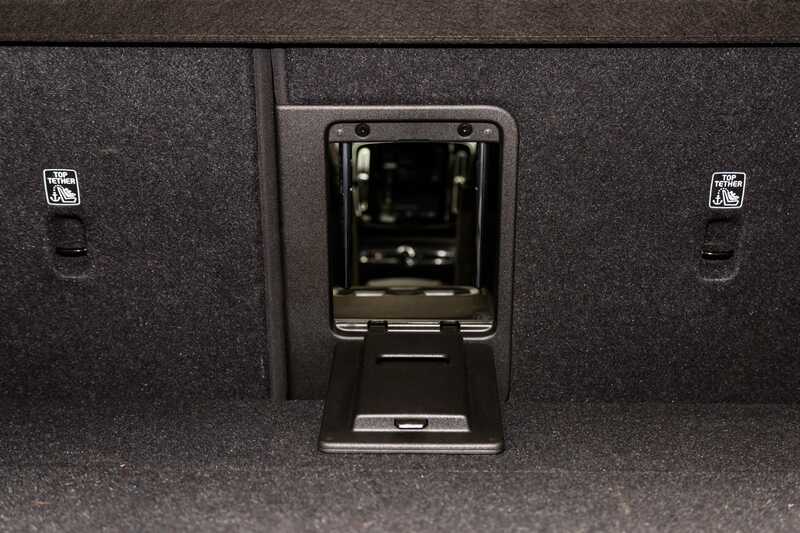 Sensus is the most Tesla-like system offered by another major automaker. 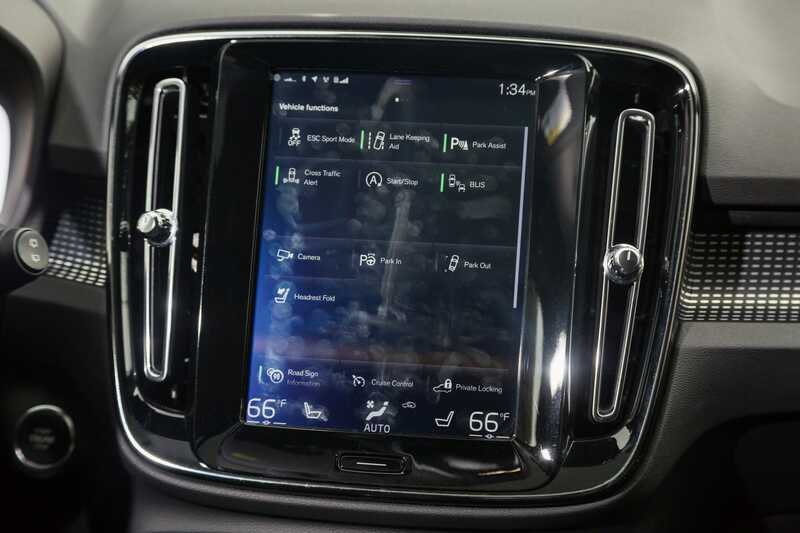 It consolidates nearly all vehicle functions into a tablet-like, swipe-able interface. It takes some getting used to, and it can be distracting. But it’s effective. It doesn’t miss a trick, either. 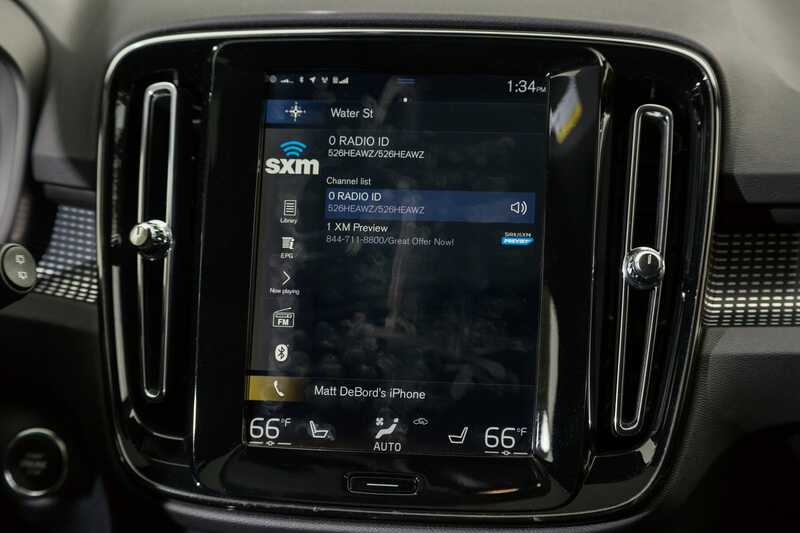 Bluetooth pairing is easy, there are USB/AUX ports, and the navigation is accurate. 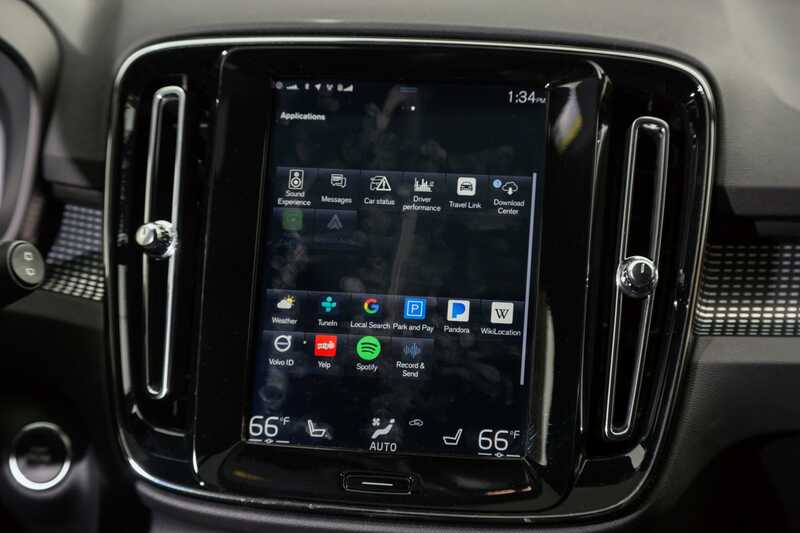 And if you can’t stand it … well, it features Apple CarPlay and Android Auto. 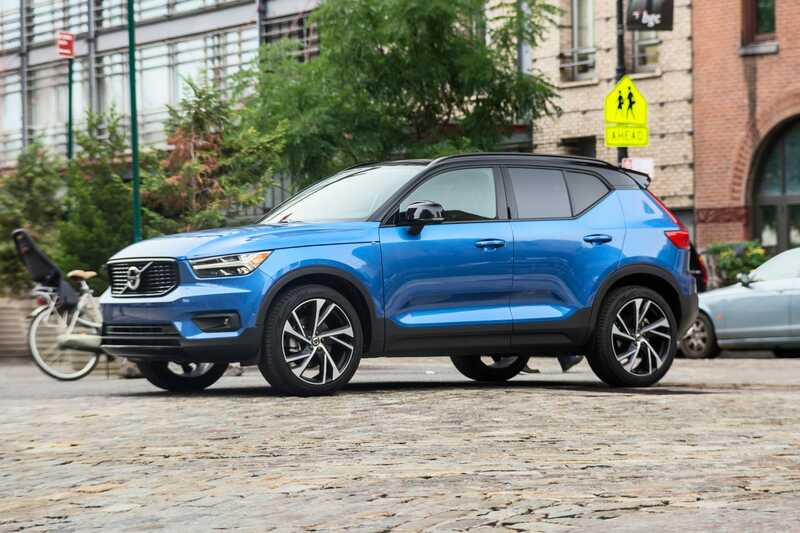 Business Insider’s Bryan Logan enjoyed the XC40 earlier this year on the West Coast and in particular liked the crossover’s semi-self-driving system. I liked it too, but I also liked plain-old driving the vehicle. The T5 R-Design upgrade is dandy for spirited piloting. 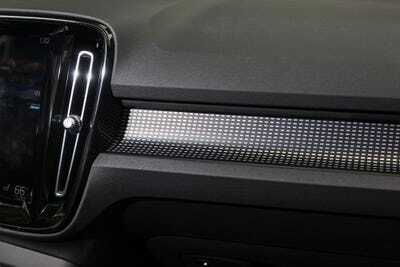 It’s no BMW or Audi, but as Volvos go, it’s refreshing. On balance, I preferred it to the XC60 (although rear legroom is obviously better in the XC60). 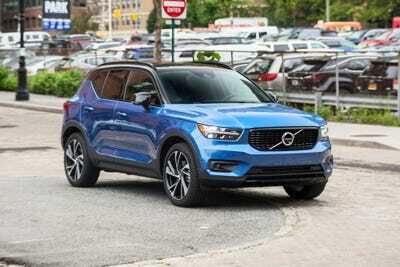 My testing involved a mix of around-town puttering and highway jaunts, so I got a decent sense of the XC40’s manners under a variety of conditions. The R-Design trim isn’t cheap, but if you want to have some fun behind the wheel, it’s worth a look. You can also dial back the pep, by using the XC40 drive-mode selector and choosing more sedate dynamics. For Volvo, the XC40 is critical to competing in the hot, hot, hot crossover segment. With a completely refreshed portfolio, the Chinese-owned Swedish stalwart has a full-size, mid-size, and compact SUV. As luxury buyers shift away from passenger cars in profitable markets, such as the US, it’s vital that Volvo capture as many buyers as possible. Generally speaking, Volvo has moved more upmarket. The unpretentious preppy chariots of old, beloved by tweedy East Coast types and with a deserved reputation for safety, have been supplanted by slicker rides – but still with a deserved reputation for safety! 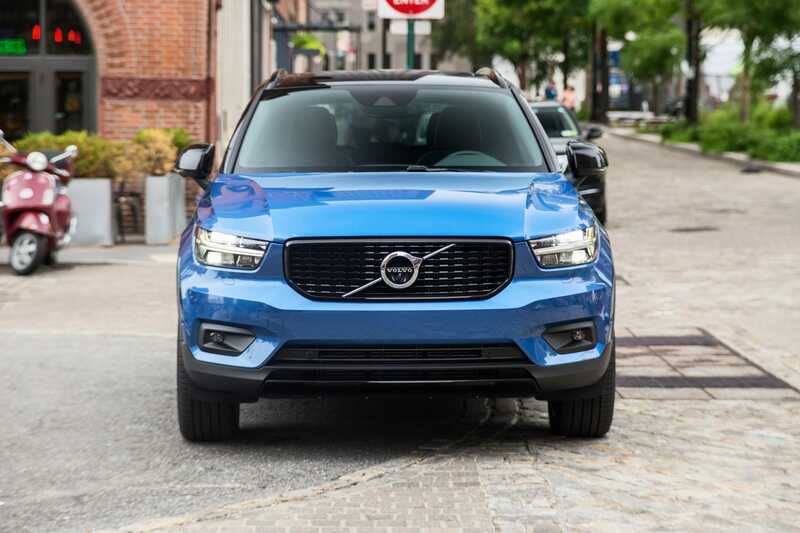 Our XC40 tester had a $US1,100 “Vision” package as an extra that included blind-spot-warning tech, as well as traffic sensors and emergency braking. 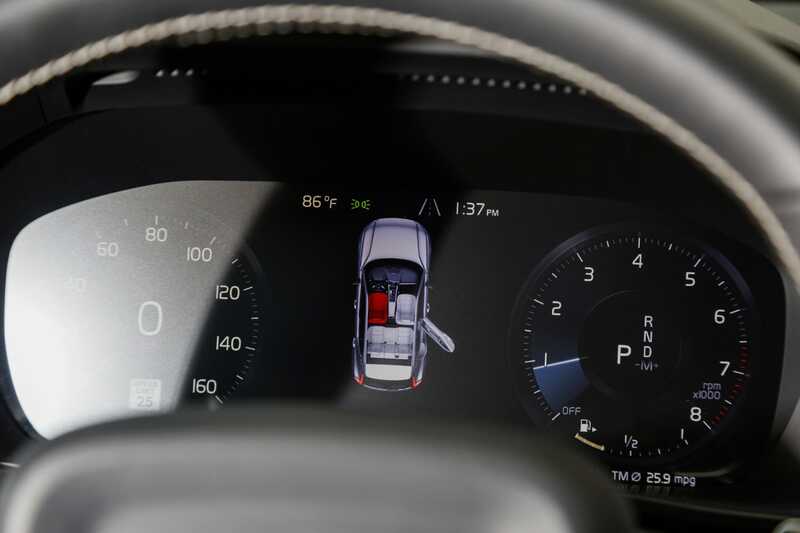 The “Pilot Assist” self-driving system, paired with adaptive cruise control, came as part of a $US900 option set – much, much cheaper than Tesla’s Autopilot. 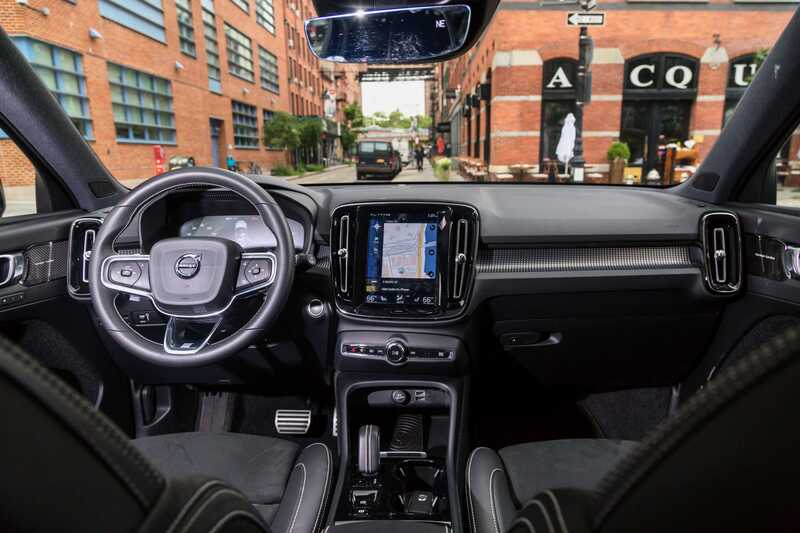 Beyond that, you’re surrounded by airbags and Volvo’s extensive safety engineering, which consists of collision avoidance systems, lane-keep assist, a road run-off-protection feature, and a steel safety cage. Whereas the XC90 proved that today’s Volvo could produce a great SUV – and the XC60 showed that the carmaker could slightly rush as vehicle to market (we still liked it, by the way) – the XC40 demonstrates that the brand has hit its stride. With a base price of about $US34,000, the XC40 can be had for a reasonable outlay of funds. 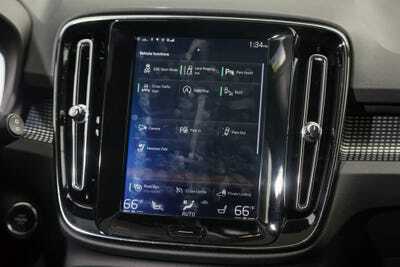 And from there, Volvo offers a sprawling list of options and trim levels. You can go basic, or choose your own measure of luxury. My tester gave me plenty to get excited about, as well, and that’s a departure for Volvo (I see this having owned two). A Volvo that thrills? It’s about time!